UPDATE: The full WYMT interview of Rand Paul is split into four parts. Part 1 can be found here. I am always looking for something interesting to talk about in relation to Appalachia. This morning, I came across this interview featuring Kentucky Senator Rand Paul. 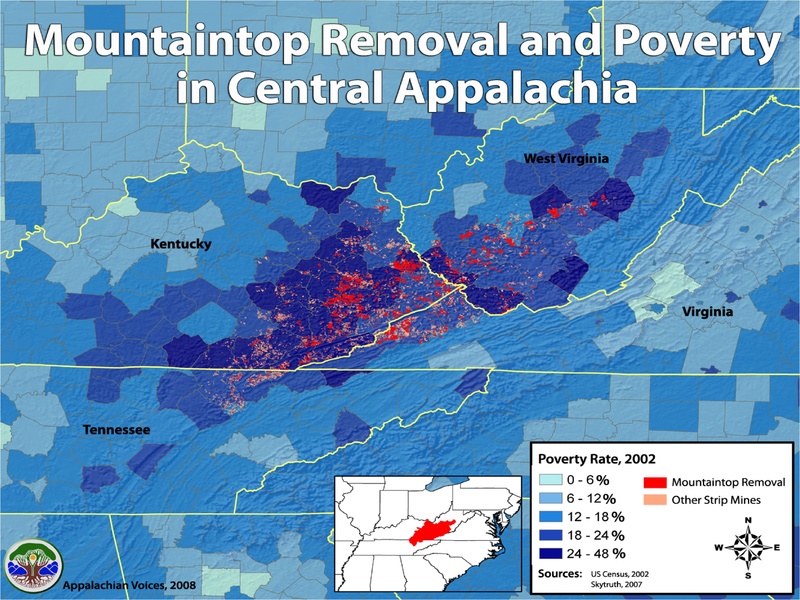 In the video below, Rand talks about Mountain Top Removal (MTR). In the past, I’ve read cherry picked statements attributed to Rand that had to do with MTR so it is nice to have a little context with those statements. You can fast forward to the 1:10 mark for when Rand actually gets to the subject of MTR. I find it interesting that apparently Paul has no problem, whatsoever, with MTR. Despite the amount of pollution, flash flooding, and numerous other atrocities that MTR creates. Paul seems content that coal companies have the right to do whatever they want to on their own private property, despite the harm it does to the surrounding areas or the environment. Social responsibility must not matter in Paul’s Kentucky. Now Rand argues that his appreciation for MTR comes from his Libertarian standings on private property. He assures viewers that this has nothing to do with him “catering to coal companies.” I’m sorry but I’m not buying Paul’s statement. Based on a few articles (here and here) Rand Paul receives campaign contributions from coal companies who coerce their workers into supporting political candidates. According to Map Light, Rand Paul is one of the largest recipients of coal money at $111,213.00. His largest campaign contributor is Alliance Coal. So if Rand Paul is not catering to coal companies…..what exactly is he catering to? One thing is for certain, he is not catering to the people of Eastern Kentucky. NOTE: I am searching for the video with the full interview. If any of you locate it, please let me know. Social responsibility doesn’t matter in Randian Objectivism, which is really little more than naked selfishness, masquerading as a philosophy. It’s not an accident that most adherents to it get hooked as self-obsessed teenagers with little or no experience in the practical realities of, you know, life and responsibility. Well said. To be fair to the base political ideology that Paul the lesser is supposed to represent, I know a lot of Libertarians that are extremely put off by Rand. But, Rand is gearing up for a Presidential run. Unlike his Dad, Rand will play to win which undoubtedly means catering to any group that will help him get there. Honestly, that comment should have sunk his candidacy right then and there. I don’t remember those comments but based on his track record with “black lung” I can believe it. I am always dumbfounded by the motivations of the average voter. Pretending that what one does on their private land has no effect on one’s neighbors is magical thinking. And that’s Libertarians for you: they live in a world of theory unencumbered by social realities. Not all Libertarians are the same. Paul is a perversion of the political ideology. Of course, you’re right. However, their tendency to an absolutist perspective makes it seem so. “Their” easy now, I’m mostly a Libertarian. I am more of a Gary Johnson camp though. These revisionists make me want to puke.